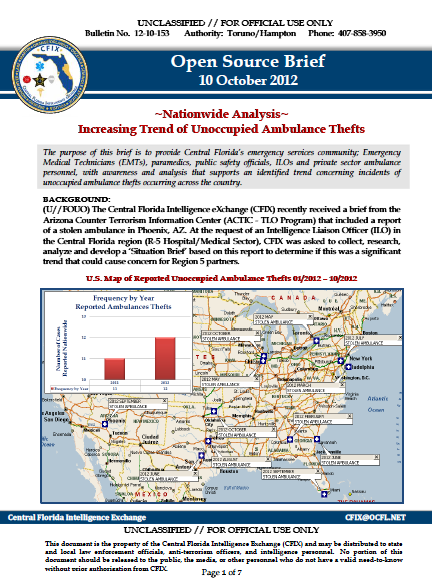 (U//FOUO) The Central Florida Intelligence eXchange (CFIX) recently received a brief from the Arizona Counter Terrorism Information Center (ACTIC – TLO Program) that included a report of a stolen ambulance in Phoenix, AZ. At the request of an Intelligence Liaison Officer (ILO) in the Central Florida region (R-5 Hospital/Medical Sector), CFIX was asked to collect, research, analyze and develop a ‘Situation Brief’ based on this report to determine if this was a significant trend that could cause concern for Region 5 partners. 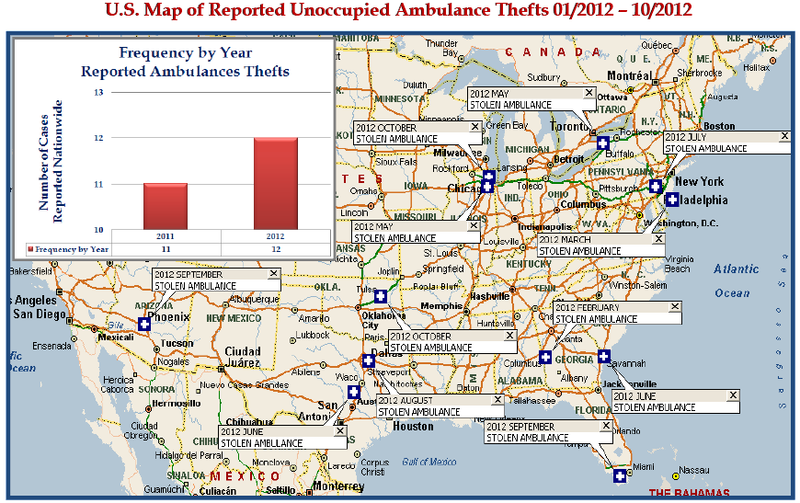 (U//FOUO) Although the cases included in this brief did not transpire within the Central Florida region, it implies that ambulance thefts could potentially occur in any jurisdiction where hospitals or ambulatory services are present. There are critical vulnerabilities associated with these thefts that could impact the emergency services sector, specifically pertaining to the safety of the public, homeland security concerns and monetary loss. (U//FOUO) The safety of the traveling public as well as pedestrians could be at risk if a subject takes off in an ambulance, especially when under the influence of drugs or alcohol. In most cases mentioned in this brief, crashes and injuries did occur due to speed and inexperience of the suspect driver. Another consideration is protocols for backup measures for a patient in need of immediate transport or care in the event an ambulance is stolen during a medical emergency. The equipment onboard or transport time may be critical for the patient’s care and may be the difference of a life or death situation. (U//FOUO) The majority of theft cases involving ambulances typically conclude as an act of criminal behavior, usually involving intoxication. There are concerns however, among counterterrorism authorities that stolen ambulances could be cloned for carrying out terrorist attacks or other criminal/malicious activity. In 2008, for example, a paramedic working the Republican National Convention (RNC) in St. Paul, MN spotted an ambulance with unusual markings. When law enforcement searched the unlocked cloned ambulance, they found a large cache of weapons, as well as bags of urine and feces that potentially could have transitioned into a mass casualty event.